FieldConnect fulfills the need for a graphical dashboard for field services companies running Microsoft Dynamics SL. The increase in billable hours per tech provides an instant revenue boost without the cost of adding new personnel. FieldConnect, a leading developer of essential mobile solutions for field service companies, is pleased to introduce FieldDispatch™, a web-based interface designed to streamline the service call creation and dispatch process. 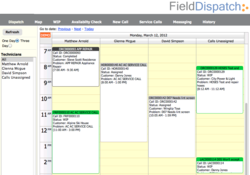 FieldDispatch combines real-time drag-and-drop calendaring with a robust set of dispatch views and search capabilities, boosting efficiency by easing the bottleneck at the dispatch point. When paired with FieldConnect’s FieldAccess™ mobile technician software for iPad and Android devices, FieldDispatch allows for real-time and extensive historical location info from mobile devices. Additionally, FieldDispatch affords the means for determining Predictive Availability, the understanding of exactly when a technician will be available for the next job. “Predictive Availability is a tool that boosts the number of jobs a tech can perform on a daily basis," said FieldConnect President Rick Galyean. "We've designed FieldDispatch not only to notify the dispatcher when the technician is getting a signature and completing a job, but Predictive Availability asks the technician after he has been on the job for a while to predict his finish time. This gives FieldDispatch the best prediction of when to make additional work ready for this technician or it lets a dispatcher best guess if he or she is going to have resources available later on that afternoon. The increase in billable hours per tech provides an instant revenue boost without the cost of adding new personnel. A number of long time, experienced SL users and members of the SL Users Group helped us mold the specification for Predictive Availability, and I want to thank all of those that helped us." FieldDispatch and other FieldConnect Service Platform products- including FieldAccess, FieldDirect™, FieldLocator™, FieldDispatch™, FieldTime™, and FieldQuotes™- are essential to the functionality of Microsoft Dynamics GP, SL, and AX, as well as Sage Timberline, ERPs. FieldConnect’s products snap directly into an organization’s existing ERP solution to link accounting software with field service operations, bringing visionary organizations to a level of unparalleled productivity. For more than a decade, FieldPledge™ has been the company’s proprietary implementation toolkit, ensuring that its many thousands of users are adopting and executing the technology in the field. This set of best practices allows the organization to immediately realize value from the FieldConnect Service Platform with unequaled simplicity and effectiveness. FieldConnect software is fully scalable to suit organizations of every size and industry. Further information is available at http://www.fieldconnect.com. Visit FieldConnect this month at Microsoft Convergence 2012 in Houston at Booth #2412. FieldConnect maximizes customer satisfaction and profit per field technician by managing real-time service call information to all service stakeholders: customers, technicians and dispatchers. Our suite of software applications extends the functionality of the Microsoft Dynamics and Sage Timberline field service solutions. FieldConnect is a privately held Microsoft Certified Partner and Sage Development Partner based in Irvine, California and has been deploying field service solutions since 2002.